I think this is it—my most favorite quilt that I’ve made so far. I have loved it since I started piecing it many years ago, and I still love it today, now that it’s finally finished. The blocks are then put together to form the stars and the secondary diamonds. 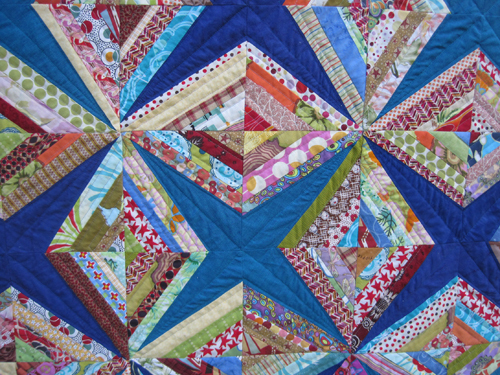 I love the shapes in the quilt, so I accentuated them with the quilting. I outlined the stars and added lines to the centers. For the diamonds, I just followed the strings in kind of a modified spiral. The quilting really was a hang-up for me, as I’ve had the quilt top done for at least two years. I’ve even had it pinned for most of that time. 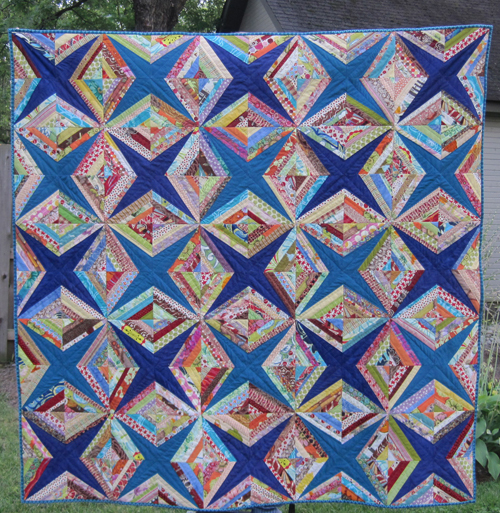 But I was afraid I might not like the quilting, and then I’d be really sad. Finally, I decided I just wanted the quilt done. So I quilted it. And while it’s nowhere near perfect, I still love it. The finished quilt is 59 x 59 inches. The backing I used is just one fabric, a teal that pretty much matches the lighter stars. It’s also the fabric I used as the binding. 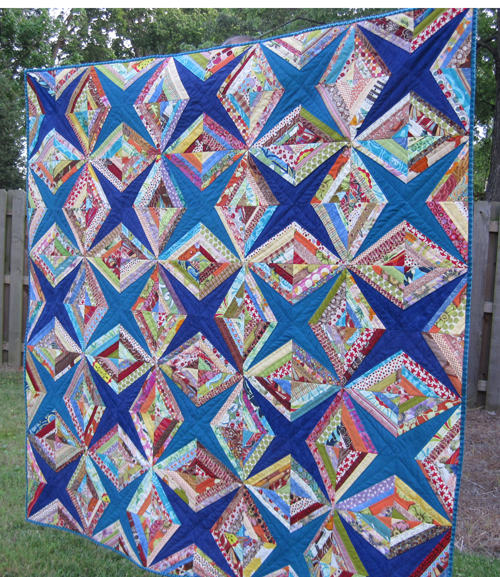 For me, this quilt is really a memory quilt—a fabric memory quilt. I love looking at all the little pieces of fabric and remembering the projects I made with each one. Baby quilts for kids who are now in middle school and high school, bags that I’ve worn out, and mug rugs I’ve given as gifts. We’ll be updating our living room soon, and I hope to hang it in there for easy viewing whenever I want to relive a few memories. I’m going to miss the September meeting of the Cincinnati Modern Quilt Guild when we will show off our third Travel Quilt blocks and get our blocks for the fourth round. So I worked ahead a bit and made blocks for these last two rounds in August. The block above is one I made for Ellen’s quilt. The original block she provided was pieced with curved strips (it’s peeking out from under my block below), and she suggested the theme of “movement” for the rest of the blocks. Kay made the white strip at the top of the image below, and Kim made the pinwheel block on the left. 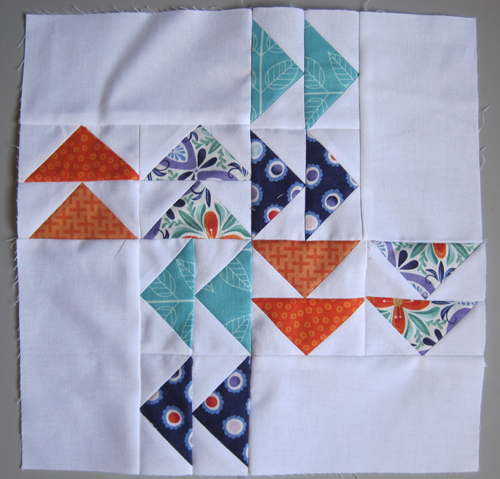 The flying geese block I made is called Follow the Leader, and it’s from the book Modern Blocks by Susanne Woods. This book is my go-to for projects like this, as there are 99 blocks, all with very different looks. 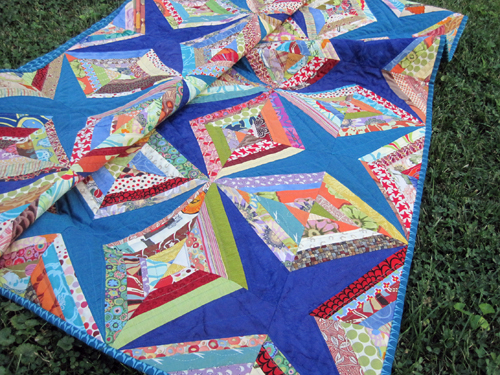 I did learn, however, that flying geese are really hard for me to make when I’m not paper piecing them. I think I sewed more than half of these guys twice to get the points close to right. 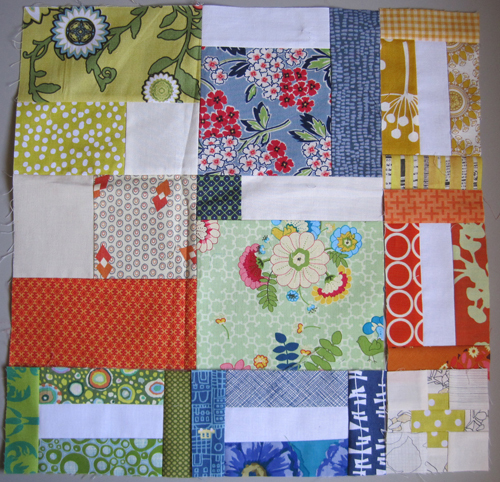 Ellen provided a lot of fabric for us to use, so the look of her blocks is very cohesive. (I added a couple fabrics from my stash, just to put a little of my own stamp on my block.) I can’t wait to see what she comes up with for her final quilt! The other block I worked on was one for Teresa. 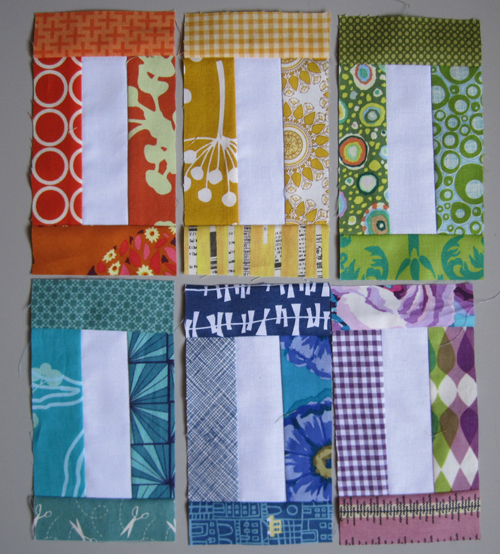 Her original block was squares and rectangles grouped by color with a bit of white mixed in. So these are the blocks I made for her. 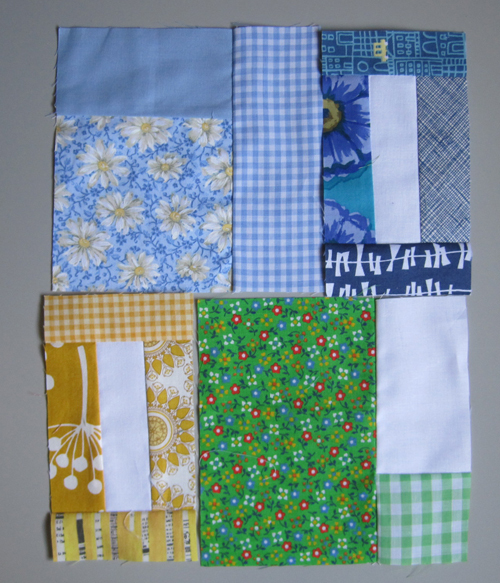 I had planned to sew them together into one 12.5 x 12.5-inch block. But then I started playing with them a bit. I noticed that one would fit perfectly with this little plus that Ellen made. And they matched up nicely with the blocks Kim made. And I really liked the way they look with Teresa’s original block. So I’ve given the pieces to Teresa, and I’ll wait to see what she decides to do with them. 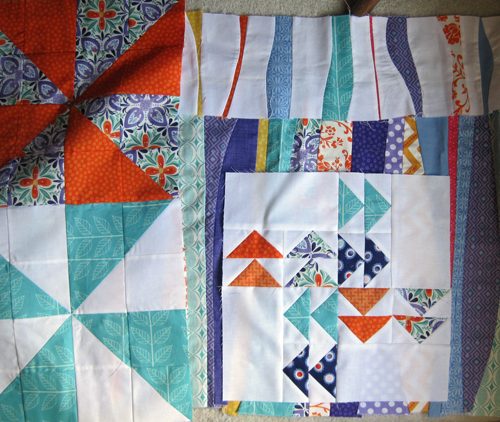 Those are the last two blocks I’ll be making for my group’s Traveling Quilt journey (see block 1 here and block 2 here). I was a bit nervous about joining in on this challenge, but I ended up enjoying the process of building on what someone else had started. I admit that not all of the blocks I made were super successful, so if they don’t appear in a finished quilt, I’ll be OK with that. But the process itself was a fun challenge. In November, I’ll be getting my shark block back along with the blocks the other people in my group made for me. I can’t wait! And I’ll be sure to show them here. Here it is! My first finished crochet project in . . . well, a very long time. As I mentioned in an earlier post, I made it for a friend who has cancer. 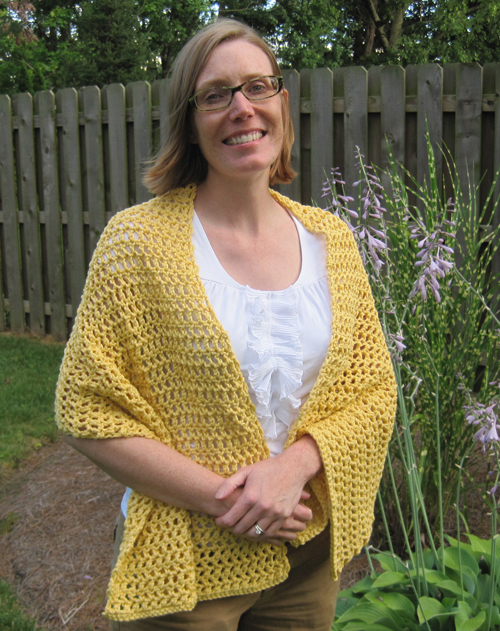 Her favorite color is yellow, and I am hoping this will wrap her in a bit of sunshine and warm thoughts as she recovers from surgery and goes through a second round of chemo. I ended up using all five hanks of yarn that I purchased for the project. 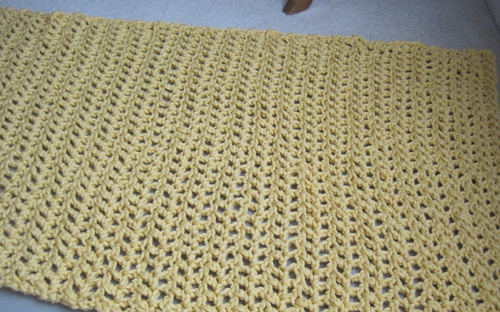 It’s 19 inches wide by 55 inches long and has a good bit of stretch to it. It’s not very fancy and has a good number of flaws, but hopefully it will bring her a smile and a bit of comfort. The part of the process I was most worried about was blocking, as I hadn’t done that for any of my projects in the past. Blocking is the shaping of the piece, while it’s wet, using pins. I layered several fluffy towels on our laundry table and blocked the shawl on that. 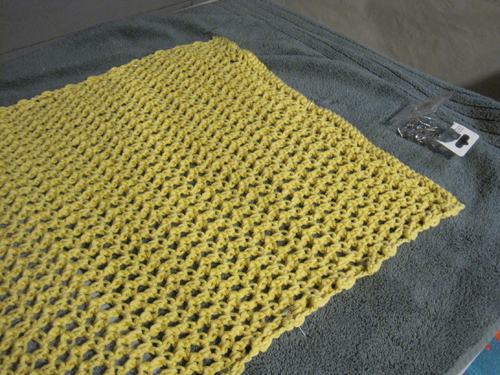 The towels were thick enough that the T-pins I used to hold the shawl stuck in nicely. I’m not sure, now, why I saw blocking as such a hurdle. I guess just the process of getting it all set up seemed daunting. But now that it is set up, I blocked a few granny squares. 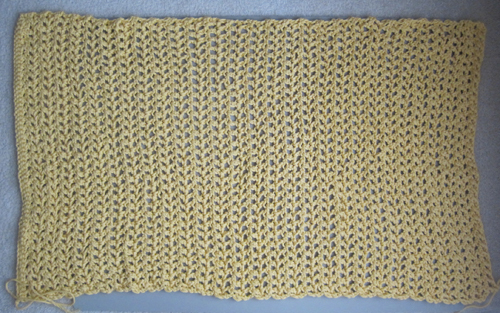 And I need to weave in the ends of a few more squares so I can block those, too. I think I see more finished crochet projects in my future! 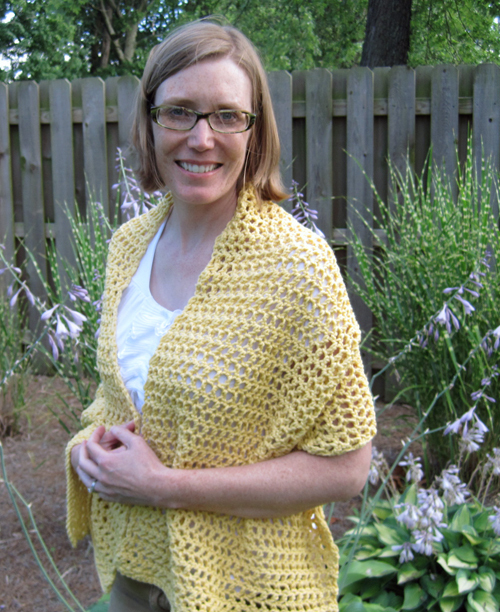 As promised, and to keep myself on track, here’s how far I got with my crocheted shawl this past week. I took this on vacation with me and used up all the yarn I had brought along. So just two (out of five) hanks left to go! For me, crocheting is the perfect craft to take to the airport, to do on the plane, and to keep my hands busy while visiting with family. It continued to be difficult to think exclusively of good intentions for my friend as I crocheted, but I think the overall vibe of the shawl will be pretty good. 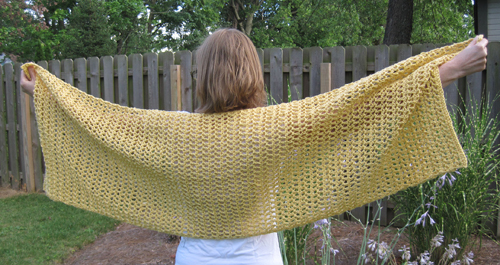 Next week, I hope to show the finished shawl!